Update "SUMMARY:Title here. ", "DESCRIPTION:Description here. ", and "DTSTART;VALUE=DATE:20160331" as needed. The recurrence rule (RRULE) field with BYSETPOS=-1 causes the event to be the first day of the month less 1 day. 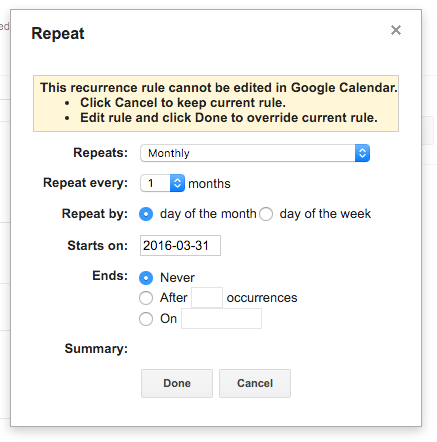 Google Calendar warning: "This event has a recurrence rule that cannot be edited in Google Calendar". 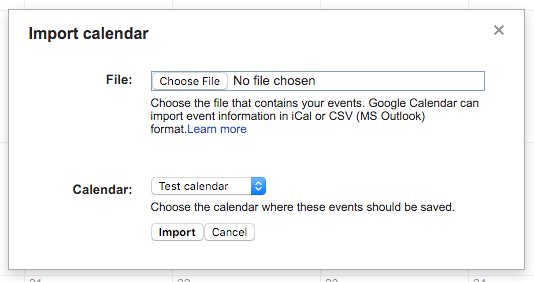 Thank you for helping overcome a major nuisance of Google Calendar! Works wonderfully. How would you edit this to create an event for, say, the day after (US) Thanksgiving, which is the 4th Thursday of November, but where the next day may actually be the 5th Friday?